Naturally, the table in the first 10-12 games of the season can be misleading - I remember one season where Charlton Athletic were 2nd or 3rd around that time, Icarus up by the sun before their wings melted and they plummeted back to Earth. Now, though? 20 games in? Usually, you know what you are by this stage of the season. There's only 18 games left, we're already out of the League Cup, and frankly there's no guarantee that we'll beat Hull City or AS Monaco in the other two competitions. Say what you will about Groundhog Day and you won't be wrong, but this season feels even worse, somehow. Actually, I've been saying it for a while, but I suspect this is the campaign where we finally get found out, where someone (read as: Southampton) finally pries the Arsene Wenger Memorial 4th-Place Trophy from our cold, dead hands. I've said it all along, and I'll say it again. The Saints are for real, friends and neighbors. I suspect Tottenham will fall away at some point because, well, they're Spurs...that's what they do. But, this Southampton side has pace, power, a strong defense, the most underrated keeper in the division and a brilliant manager who has been a winner damn near everywhere he's been. The way I see it? We have none of those things. The name and the pedigree alone are not going to cut it this time. The performance in the Southampton match is all the more disappointing given that the previous two matches were the polar opposite. Whatever your thoughts about whether we should have struggled to beat QPR or not, those two games were the exact kind of ground-out results that good teams need from time to time. That's the worst part about it. This Arsenal side have turned getting our hopes up into a cottage industry, which is bizarre in a way because that truth lives in parallel to the more pressing truth of our ongoing Groundhog Day stasis. The QPR game, in retrospect, perhaps held some portents for what was to come. They're godawful, as evidenced by their defense featuring both the utterly abysmal Armand Traore and Rio Ferdinand, who I believe made his debut as part of a Sumerian XI in 4000 BC. Arsenal were all over them in the game's early stages, and honestly we should have been home and dry long before that idiot Olivier Giroud got himself sent off for a ridiculous overreaction to a garden-variety challenge. Still, they couldn't live with Alexis Sanchez. Despite missing a penalty with a poorly-struck effort, he later found the net with an excellently-guided header. So far, so good. But, after the red card QPR found their bearings and dominated the rest of the way. Mathieu Debuchy - who is clearly still knocking off about 12 layers of rust from his long injury layoff - gifted them a penalty late on, and we were lucky that they weren't given another at the death. Thank goodness that Tommy Rosicky managed to convert from a chance given to him on a plate by Sanchez, otherwise this would have been an all-out disaster. A win is a win is a win, but at the end of the day we barely crawled over the finish line against horrid relegation fodder. The next game was much better, though. It too was a little too close for comfort, but West Ham are well in form and Upton Park is never the easiest of venues to pick up points in besides. This time, the opponents were the ones to dominate early, one goal being called back for offside and another shot rattling the crossbar. Besides that though, the Hammers were repelled by the excellence of Wojciech Szczesny. His horror show against Southampton is all the more strange when compared to his calm and composed performance before it. West Ham launched ball after ball into the penalty area, often looking for the head of Andy Carroll. However, Szczesny's timing was always perfect, his handling always assured. Szczesny's brilliance gave us time to get back into the game, and a 5-minute blitzkrieg just before the half gave us the goals that proved so vital. First, Winston Reid tripped Cazorla in the penalty area, and the little Spaniard stepped up to convert past Adrian. Minutes later, a lung-busting run from Alex Oxlade-Chamberlain got him space down by the goal line, and his cross to the onrushing Danny Welbeck at the back post was perfect. Boom. Just like the old Arsenal. It wouldn't be New Arsenal if we didn't make things interesting, though, Sure enough, 10 minutes after the break, Debuchy was again badly at fault, leaving Cheikhu Kouyate with a free header. It was always going to be nerve-wracking defending a one-goal lead for 40 minutes, but the boys managed it well. In fact, the home side's nerve started to flag in the late going, and only Adrian (who I think might be the most-improved player, at any position, in the entire division) kept the Hammers in it. Coming off of that platform, we had the right to expect a performance in the season's most massive game. Instead, the Gunners were at panic stations from the opening whistle, once again having buckled under the pressure of expectation, once again wilting against any team that can honestly fight back. As I keep saying, it's all so boring now. You know the drill by now, I'm sure. The Saints were short-handed themselves, with two of their most influential players in Nathaniel Clyne and Morgan Schneiderlin unavailable. Sure, we have our injury problems as well, but a team with pretensions of greatness does not perform like this regardless of personnel. Arsenal were flat-out scared, and it showed...from first man to last. The goals we conceded would not have been out of place on a Sunday-league park. Everyone in the back 5 had brutal games, though perhaps Kieran Gibbs was a shade better than the rest. Szczesny's ramble outside his area gifted Sadio Mane with a free shot at an unguarded goal, but Laurent Koscielny's decision-making was also horrendous there. Then, a ridiculous clearing attempt by Debuchy led to Szczesny's panicked attempt to get it away, which sadly went right to Dusan Tadic. It could have been worse, too. Graziano Pelle had a fairly bad day at the office, otherwise the Saints might have won by the kind of scoreline that can shatter a season. Talk about clutching at straws, but there you go. This leaves us in the precarious position that you see at the top of the post. Southampton are not going away. Manchester United, New Year's draw against Stoke aside, are rounding into form under Louis van Gaal. 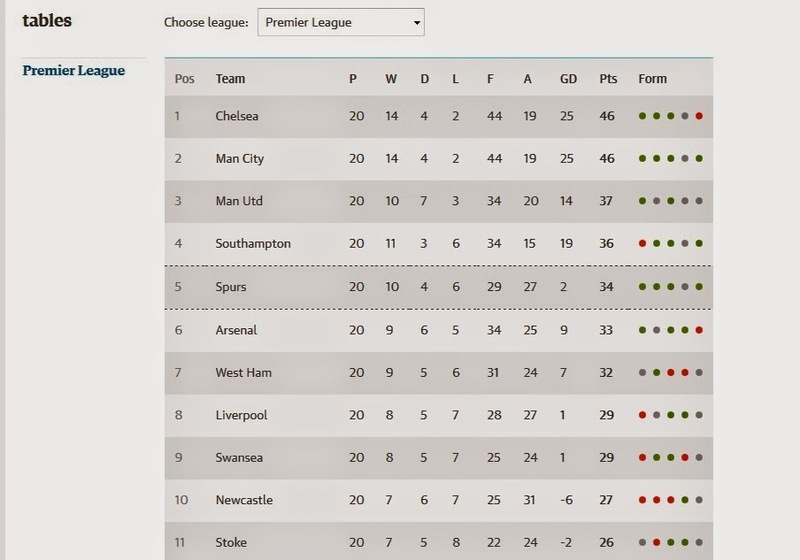 Chelsea and Manchester City will of course be fighting for the title, probably all the way to the wire. Jokes about Spurs aside, at this point you write them off at your peril. West Ham has just gone through a punishing part of their schedule, and can look forward to a run of winnable games. One could even see Liverpool getting their act together and getting on a run towards the end of the season. We have never been in greater danger of falling out of the top four since Arsene Wenger arrived at the club. The woods have never been populated with as many predators, and we have arguably never had so callow a squad...and man, is that ever saying something. When it comes right down to it, all of this...ALL of this...begins and ends with the manager. He is tactically out-thought in every match...not just by the Jose Mourinhos of the world, but also neophytes like Gary Monk. He stubbornly won't play guys like Lukas Podolski, who can give us an added dimension that we're lacking. He foolishly went into the season with no cover in defense or defensive midfield, which of course has been discussed to death. There is a serious dearth of leadership in this team, precisely when we need it the absolute most. There is no earthly reason why a World Cup winner like Per Mertesacker should be playing like a trialist at Hartlepool United's U-21s. There is no reason why Koscielny should have to play on creaking Achilles tendons. There is no reason why Szczesny's only competition should be a perma-crocked David Ospina and an Argentinian fetus. There is no reason why our midfield should put up less fight than a well-placed "Keep Out" sign. There is no reason why Mesut Ozil, before his injury, should drift aimlessly through games while he counts down the days until he leaves. There is no reason why we should be so light up top, Alexis has to play every game until the inevitable season-ending injury. I hate to be Mr. Doom and Gloom, but the facts are staring us directly in the face. This is not a top-four team, and it damn sure is not a top-four manager. This is our new reality. Happy New Year. Same as the other 10 before it. Sean Swift is a contributing writer to The Modern Gooner, and the Ticket Liaison for Arsenal NYC. Should you wish to follow me on Twitter (FYI - I go weeks without logging in at times), I'm at @thefallen29. I promise I'm not always this much of a Negative Nancy, but I'm still feeling it from a New Year's that was, basically, a reading from the gospel according to Shane Macgowan.